Hiking back down Hellhole Canyon in Anza Borrego Desert State Park in southern California, on our March 4th wildflower excursion, we found this little natural still-life all set up and waiting. 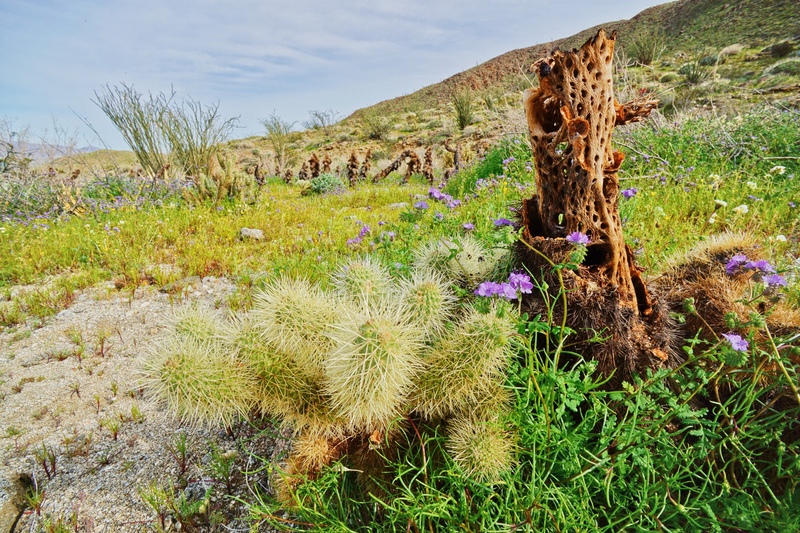 The big cholla stump and the short cholla with the Common Phacelia twined around it, against the backdrop of the Anza Borrego Desert canyon landscape and the Ocotillos standing tall…something for the eye in every corner. In-camera HDR. Sony a51000 with 16mm prime and UWA converter for an 18mm equivalent field of view. Processed in Polarr. I realize this morning that I have been misspelling the Sonora in Arizona Sonora Desert Museum for two weeks now. Time to correct it. 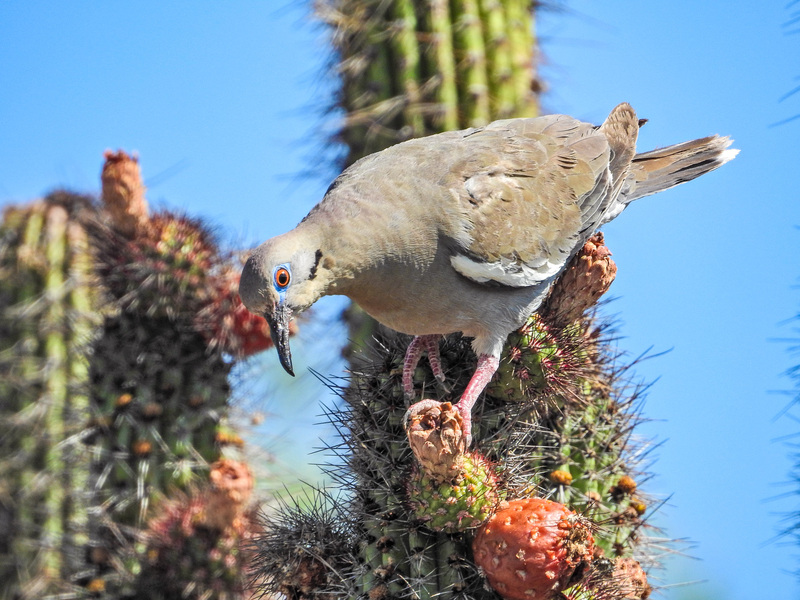 This is a White-winged Dove, the common dove of the southwest, on, I believe, an organ pipe cactus on the grounds of the museum. Easy to overlook, but beautiful in close view. Nikon P900 at 1600mm equivalent field of view. 1/500th @ ISO 180 @ f6.3. Processed in Lightroom. Anza Borrego Desert SP, CA. Beaver-tail, Choia, Fishhook, Beaver-tail. 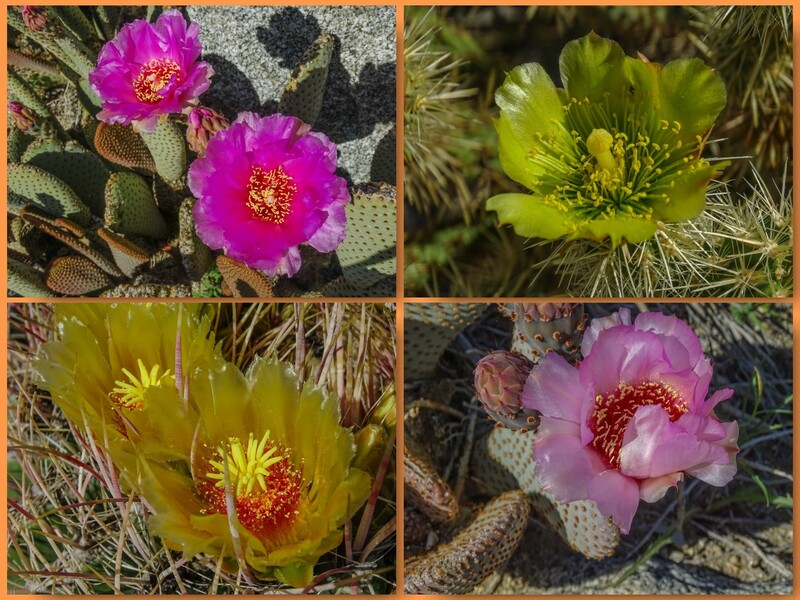 While I went to Anza Borrego Desert State Park in hopes of finding dunes covered with a carpet of wildflowers…and did indeed find them…the cacti were also coming into bloom. Hard to ignore! This panel shows, clockwise from the upper left, Beaver-tail, Chioa, Fishhook, and Beaver-tail with a slightly different color. I love cactus flowers. And the fact that I so rarely get to photograph them only adds to the attraction. Sony HX400V. Processed in Lightroom and assembled in Phototastic on my Surface Pro 3 tablet. Joy to the World! Happy Sunday! This is a hand-carved creche we found in Albuquerque’s Old Town, years ago, and it is still one of my favorites. It came from a Christmas Shop that was, litterally, filled with creches and was, at the time, one of the few we could afford. One of the wise men has gone missing over the years, but we still put it out every Christmas. It is elegant in its simplicity. And here, where the girls happened to place it this year, it forms an interesting tableau with the Christmas Cactus hanging over it. Interesting enough for a natural light photo. Samsung Smart Camera WB800F. Smart Auto set the exposure to its Low Light mode and captured the scene at ISO 200. Processed as an HDR in Snapseed and then fine tuned using the Tune Image and Detail tools. Cropped slightly at the sides. 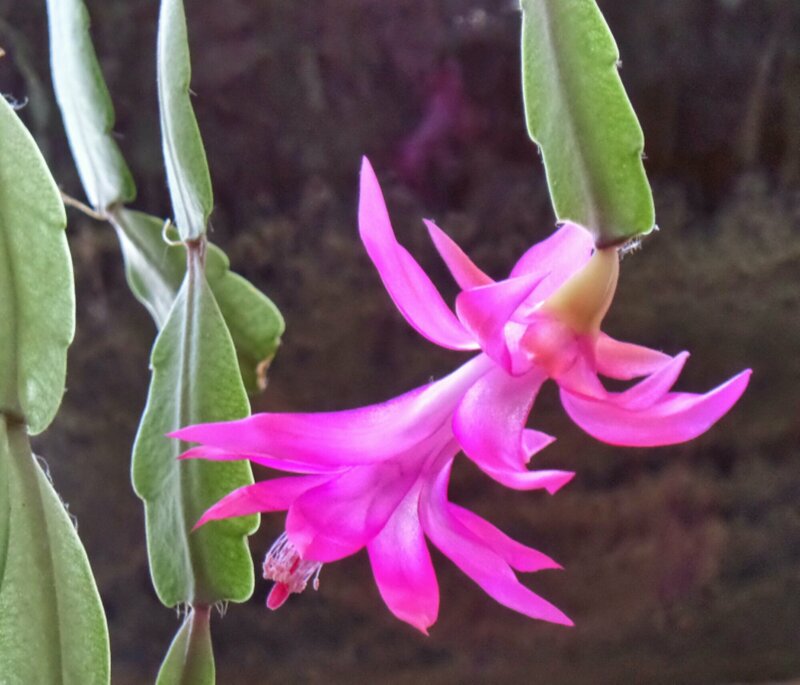 And for the Sunday Thought: The image is both exotic, highly unlikely, with the ornate blossoms of a cactus native to the coast of south-eastern Brazil, grown now, for many years, here in Southern Maine, hanging over a creche bought in Albuquerque New Mexico, and carved, if I remember rightly, somewhere in Asia…and homely in its simplicity. The carving is rough…simple…suggesting the subjects more than rendering them, and the composition is casual but studied, with each figure placed to please. The whole reaches toward, and is charged with, a celebration of the birth in the stable…which was certainly both exotic in its unlikely juxtaposition of the earthly and the divine…and humble in itself. The light here, spilling in at the edges, catches every detail, and makes the colors burn with intensity. It is a fitting image, I think, to convey at least a little of the totally unlikely birth that changed the world…and goes on changing it, one person at a time, as individuals identify with the story, and are touched by the loving reality behind it…as the light breaks in at the edges, and makes the colors of love burn with a transforming intensity. Happy Sunday! And a Joyous Christmas to you and yours! I have not had anything to share for Floral Friday for months now. It is certainly the non-flowering season in Southern Maine, and I have been concentrating on other things…birds and bugs…on my trips further afield. 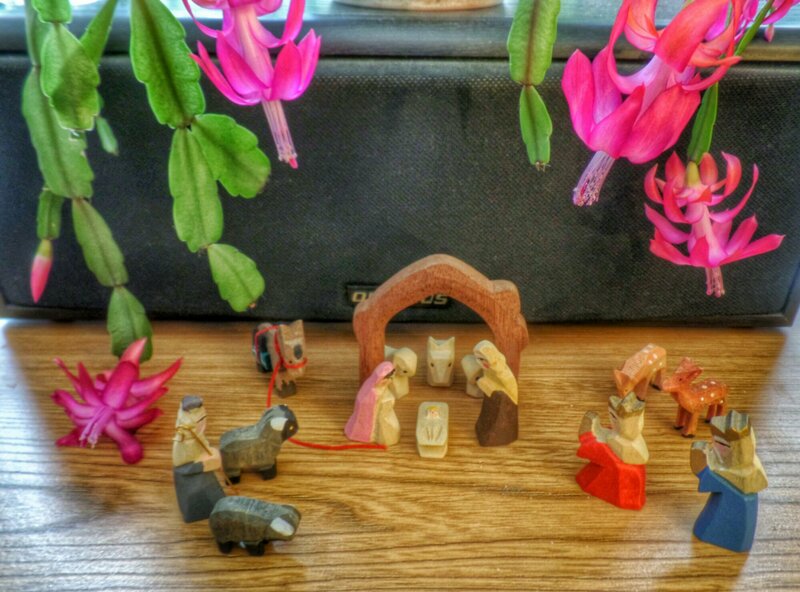 But this week, our faithful Christmas Cactus, now many years old, proved it was worth tending it during its long dormancy by bursting into bloom…just in time for Christmas! I have been playing with natural light shots. This is from a fair distance, 4 feet or so, using the long end of the zoom on the Samsung Smart Camera WB800F and Smart Auto Macro. Dedicated Macro Mode on the Samsung auto sets the zoom to about 28mm, but Smart Auto Macro allows similar results at all zoom lengths. Go figure. ISO 800 @ 1/20th @ f5.8. 408mm equivalent field of view. Processed in Snapseed on the Samsung Galaxy Note 10.1 2014. Gamma decreased slightly in dev.macgiver’s Photo Editor. Cropped slightly for composition. 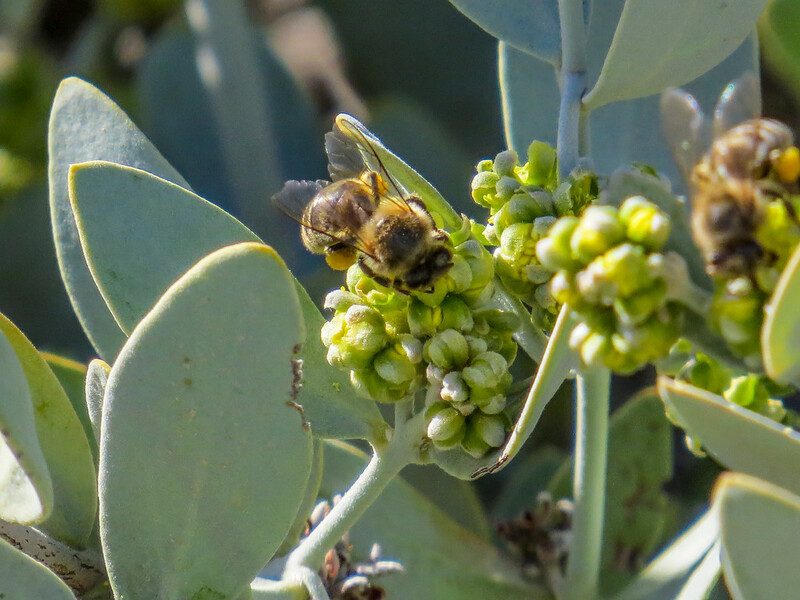 It is, of course, the Eager Beaver and the Busy Bee…but this bee, or these bees since there were many of them, were so eager for nectar that they were attacking the barley opened blossoms of this flowering succulent shrub at the Anza Borrego Desert Visitor Center. Canon SX50HS. Program with iContrast and Auto Shadow Fill. –1/3EV exposure compensation. 1800mm equivalent (1200 optical zoom plus 1.5x Digital Tel Converter) from about 5 feet. f6.5 @ 1/1000th @ ISO 500. Processed in Lightroom for intensity, clarity, and sharpness. By an odd coincidence (I don’t actually believe in coincidence, but it makes a neat shorthand for “I have not yet figured out why”) I am back in Texas for the second time in less than a month. North Texas this time. Graham, in fact, which according to the brochure in the hotel lobby, is The Gem of North Texas. Eventually you will see the sunset pics I took last night from the high bluff south of town, but for today, to keep it in Texas, I will return to the Rio Grande Valley and Arroyo Colorado World Birding Center in Harlingen Texas. I popped out there after setting up my booth at the Rio Grande Valley Birding Festival last month. 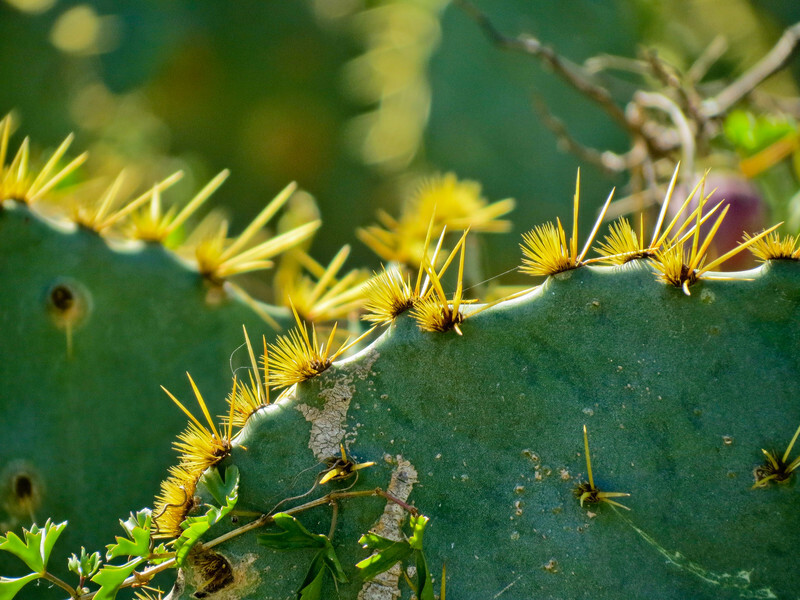 Bird life, as I detailed in another post, was sparse (totally the wrong time of day), but there were dragonflies, and some very interesting light effects on the forest of tree-like prickly pear cactus. As I was working the area, I zoomed in on this tight composition of a single pad. I love the way the light is caught in the spines, and the receding planes of focus behind the pad in the foreground…and the general geometry of the curves. Canon SX40HS at 840mm equivalent field of view. f5.8 @ 1/400th @ ISO 200. Program with iContrast and –1/3ED exposure compensation. Processed in Lightroom for Intensity and Sharpness. 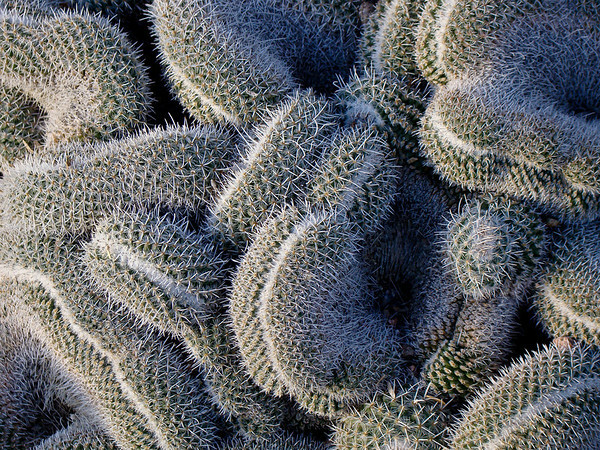 One of the things that fascinates me most about the desert and cacti is the things the light does to the spines and convolutions of the plants. I was at the Desert Botanical Gardens early on my last visit (I am there early on every visit…a necessity any season but winter, due to Phoenix heat…and preferable even in winter), and the light was still oblique enough to provide interesting effects. 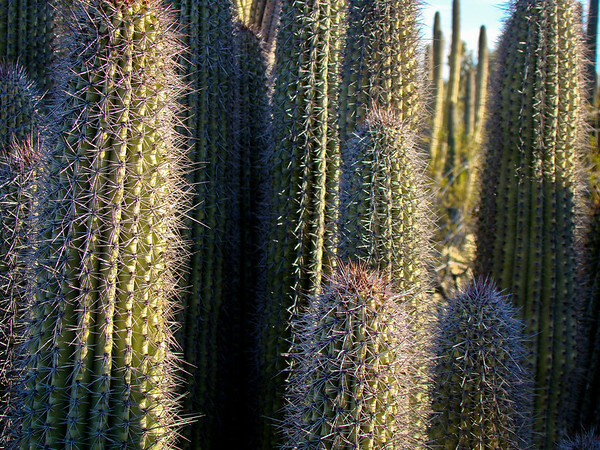 This cluster of Organ Pipe cacti is a case in point. I moved in close at about 75mm equivalent to crop just this section of the tall plants, because it is the light effects, not the cacti themselves, or the desert landscape that contains them, that I am interested in. Sony DSC H50 at about 75mm equivalent. F4.0 @ 1/200th @ ISO 100. Programmed auto. Punch and Sharpen Landscape presets in Lightroom. >> Clarity and > Vibrance. 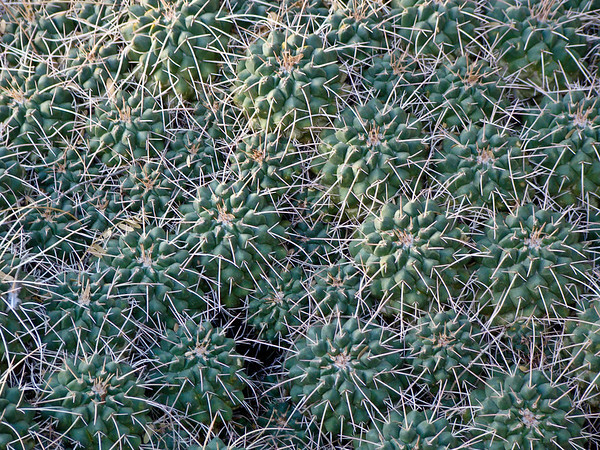 From Desert Botanical Gardens 09. Okay, so this is maybe cheating a little bit because this is not a pic of the day, it is three pics of the day rolled into one. Sort of. I took these images seconds apart, without moving more than a step and a half turn. 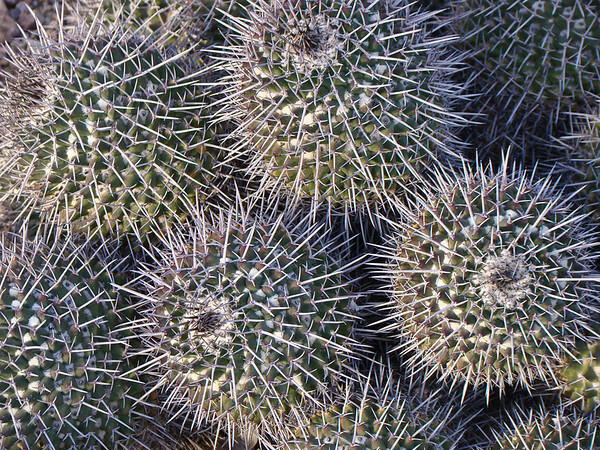 There is is a display of native cacti just below the Terrace Restaurant at the Desert Botanical Garden in Phoenix. The sun had gone behind a momentary cloud…just enough, and just long enough, to provide some filtration for these shots…a softening of the light that brought out the patterns. The first two were shot at about 180mm equivalent for framing. The third was taken from the same spot, but I zoomed up to almost 300mm equivalent to frame a slightly more distant clump. They form a kind of triptych study of the way light interacts with these spiny shapes. Sony DSC H50 at 180mm and 300mm equivalents. F4, F3.5, F4 @ 1/125th, 1/60th, 1/40th @ ISO 100. Programmed auto. And here they are, actually arranged as a classical triptych panel. 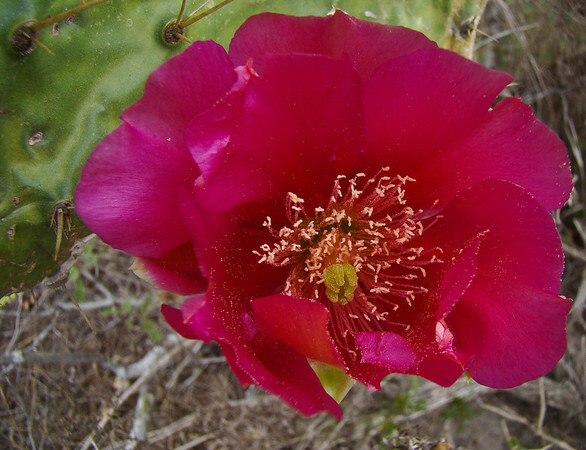 Prickly Pear comes in at least 2 colors in Texas, yesterday’s yellow and today’s red. The exposure problem is the same: keeping the predominant color from burning out. Same solution. -1.3 EV exposure compensation, and restore exposure in Lightroom to desired effect. Sony DSC H50 at full wide and macro. F4.5 @ 1/250th @ ISO 100. Programed Auto with -1.3 EV. Cropped from the right. Added Clarity and Vibrance in Lightroom. Landscape sharpen preset.